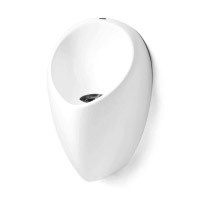 Uridan Cadet waterless urinals are ideal for offices, bars, hotels and restaurants. The Cadet is smaller than the Admiral so it’s ideal in smaller applications. The Uridan patented waterless trap provides a liquid odour barrier like a normal trap (see video below). No odours can get though the Urilock liquid barrier and since there are no membranes or moving parts the trap performace does not deteriorate over time. The waterless urinal must be sprayed every day with Uriclean to ensure that no urine will adhere to the fitting and cause an odour. Uridan waterless urinals are easy to clean and very durable. Suitable for males only.